Spring is finally here! It’s time to come out of hibernation and soak up some of the beautiful spring weather. I love the new flowers, the green grass and the promise that summer is on the way. What are your favorite things about spring? 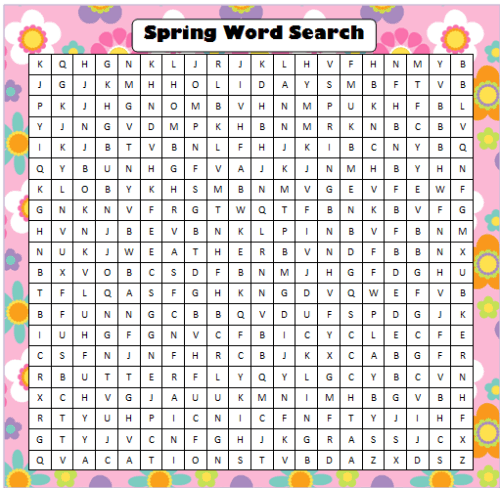 This free printable Spring Word Search is a fun activity to help entertain your kids at home, in the car or while traveling during spring break! Simply print the freebie (searchable words are on the bottom of the game) and have your kids search for the words and highlight them once each word is found. What other words would you add to this game? Looking for more freebies for family fun? Check out our free Printable Games page for loads of scavenger hunts, charades, trivia, word searches, word scrambles and more. Charades are a really popular idea around Moms & Munchkins and we have some pretty silly ones to share that are sure to cause some family giggles. Also, with so many fun holidays coming up this spring and summer, you’ll want to check out our Holiday Fun page filled with ideas for all of the major (plus many of the little-known) holidays to celebrate with your family. We have party ideas, activities, recipes and more. They are all sorted by month so it is easy to find the holiday you are searching for ideas on. Have you followed our social media accounts yet like Facebook, Twitter, Pinterest or our new RSS feed Bloglovin’? We welcome you to join our rapidly growing community.